Usually every year we organise a basic training. 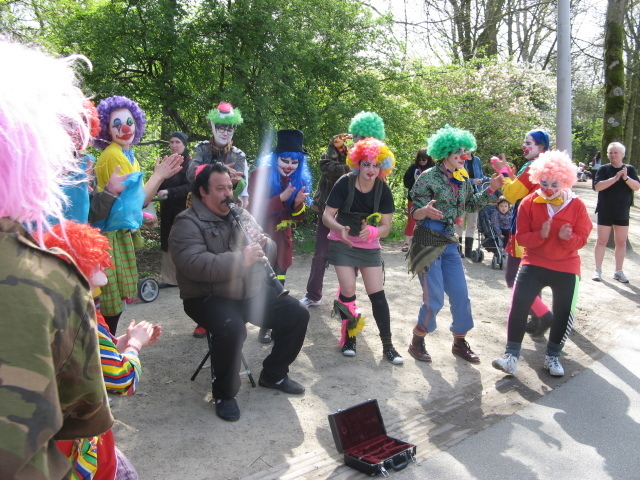 A training you need to join local and international rebel clown actions. In Amsterdam we call it the RABBIT-weekend: Rebel Act Big Basic Intervention Training. The weekend is in a gym studio in Amsterdam from Friday night 18.00 till Sunday 19.00. Every training could be slightly different: depends on who trains the new rebel clowns. The training is in English by an experienced rebel clown from UK, Germany or France. We start Friday night with a personal introduction round and a presentation about contemporary action forms, how it began with CIRCA (Clandestine Insurgent Rebel Clown Army) and how Rebelact developed an own way of rebel clowning. You'll see some videos from past and present: actions around G8 summits and a few interventions by clowns from Rebelact. On Saturday and Sunday morning we start with a warm-up of body and voice. You learn some basic physical and narrative improvisation. We take you on a journey to find your inner clown and release the spontaneous self. You learn the 'Yippiee', 'Rubber Chicken' and much more. Of course the basic rebel clown techniques get fooool attention: fishing, socking, marching, etc. You also learn how to cooperate in a group of rebel clowns. Next to it some activist techniques about making quick decisions on the streets. If there's time left we explain you about how the Amsterdam Rebel Clowns develop and select interventions. When to use the 'Rebel Clown Army' concept and when to use other forms. How to to push the borders of your imagination. On Sunday afternoon we end the training with a first intervention by new rebel clowns. Usually not a very complicated one. The moment to experience rebel clowning on the streets for the first time. After the action we have a last round to exchange thoughts about the weekend experiences. If you wish you get practical information about how to join Rebelact or another gaggle. The training is a great way of experiencing rebel clowning without obligations. Afterwards you feel if it make sense to go further and deeper into your clown. Although Rebelact doesn't use the 'Clown Army' techniques very often, the skills you develop during the basic training also help with interventions who have completely other forms. Working in a group, spontaneous play, developing your fantasy and creativity: it's all very much needed whatever kind of action you do! Besides, humour is a very powerful weapon and almost always part of the Rebelact interventions! Joining the training is an important first step. Of course it helps if you attend other improvisation and theatre workshops, but the real thing is what you do and learn on the streets, sometimes with a small group, sometimes with many others. With the group you develop abilities and trust to go for the max! To take back your power and free a situation in public space from being far too predictable! If you've any questions about the training or wish to join the next RABBIT-weekend, please mail Rebelact. Sunday, April 10th 2011: final day of the basic training by trainer General Confusion. An excellent opportunity to practise spontaneous play in Amsterdam's Vondelpark.